An architect who fell in love with a special room. Soon after graduating from USC School of Architecture a client asked me to work with a kitchen designer in a remodel of their home. This was a new experience as I had always drawn the basic kitchen layout but never claimed to be a kitchen expert. But when I experienced the kitchen designer’s knowledge, and how important the kitchen design process was to the client’s satisfaction with the total design, I realized my calling. With a new passion, I set out to master kitchen design emphasizing planning based on functional needs and design style based on a client’s tastes and the character of their home. In 1981, I established Kitchen Design Studio in Los Angeles to provide a showroom environment for concepts which freed clients from kitchen design dominated by depression era ‘work triangle’ studies and kitchens designed as isolated work rooms that separated the cook from life in the rest of the home. Modesty aside, from that studio, I established a national reputation as a kitchen design trendsetter and practiced from the original Kitchen Design Studio until I moved to the Bellingham area in 2004. I am very happy to continue my design practice from my new home in the Great Northwest. 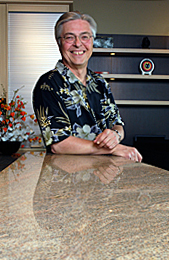 My passion for kitchen design and expertise in cabinetry, appliances and related elements support the quality of advice and consultation I bring to the design process. I take pride in an ability to communicate both with clients and the professionals and trades people involved in making custom kitchens a practical reality with a minimum of stress to all. If you are planning a new home or a kitchen remodel, you owe it to yourself to at least call me and schedule a complimentary pre-design consultation. I can refer you to clients in the Bellingham, WA area who will happily discuss their experiences working with me.